A Barnsley electrical engineering company has secured the contract to maintain and service the electrical equipment for Bannatyne’s health clubs, spas and hotels across the UK after only setting-up business five months ago. Shaun Pursley and Sean Smith set the company up in November and are already working as the main electrical testing contractor to Bannatyne’s Fitness Ltd, which has 65 health clubs and five hotels ranging from Inverness to Eastbourne. Shaun originally rang up Bannatyne’s head office by chance to enquire about work and got through to one of the main directors, who invited them to their head office in Darlington. While there, the company were asked to service one of the health clubs as a trial run and impressed with their workmanship. They were then asked to service electrical items for all Bannatyne’s health clubs and hotels. Nationwide Electrical has since taken on its first member of staff to help service Bannatyne’s and to keep up with increasing demand for their services, which include electrical maintenance, installation, security systems, portable appliance testing (PAT) and risk assessment. The company has been helped to set-up by the business support programme SmartStart, which is provided by Barnsley Business and Innovation Centre (BBIC), working in partnership with Barnsley Council, for business support. 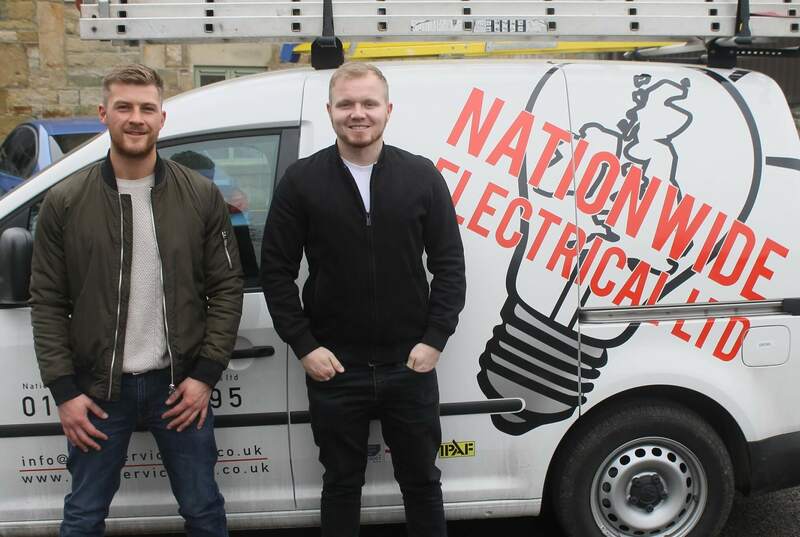 Shaun and Sean, both 25, have known each other for 15 years, and both took apprentices at City and Guilds in electrical testing and installation. As the company grows, they are looking to take on apprentices. Sean said: “We both had such great experiences with our apprenticeships and we’ve had first-hand experience of how well they work. Nationwide Electrical, who have just moved into their new offices at BBIC, offer their services to all commercial, domestic, retail and industrial customers. The company has also become an approved electrical supplier to Barnsley Council. They have received full accreditation by British Standards, become an approved contractor by NICEIC (National Inspection Council for Electrical Installation Contracting) and gained their ISO 9001. BBIC’s SmartStart business development manager Sarah Valentine said: “It’s great to see Shaun and Sean at Nationwide Electrical secure such a big contract within their first four months of trading. Attached photograph shows Shaun Pursley (left) and Sean Smith (right) of Nationwide Electrical Ltd.